Hello there!! I have a simple project to share that I hope you’ll enjoy. 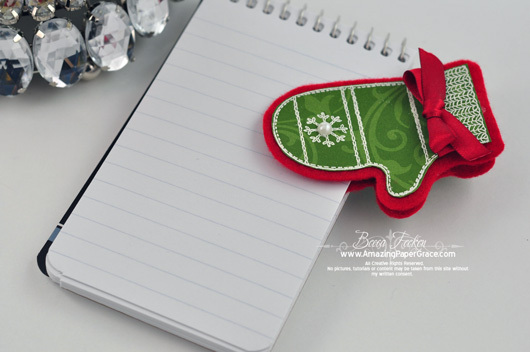 By the way, welcome to JustRite Stampers’ newest Wednesday feature, 12 Weeks of Christmas Blog Hops – Week 7! Every Wednesday up until Thanksgiving some of your favorite designers will be joining some of the JustRite design team for a series of Christmas blog hops, showcasing JustRite’s entire Christmas Collection of stamps! You also might see some projects from the JustRite design team, using some of our newly released CLING stamps! You can find our new collection of cling stamps HERE. This week, the designers joining us are most of the Spellbinders and Caardvarks design teams! So mark your calendars for Wednesdays at 9am Central for great Christmas gift, card & project ideas, starting at the JustRite Inspiration blog! For my project simply had to make a pair of felt covered, stamped mitten clips. Using JustRite Stampers new cling set called Sparky the Snowman – Cling and Spellbinders Nested Mittens, I had the perfect excuse to try a pair and it was far simpler than I thought. I simply stamped and embossed the mitten then cut it out leaving very little margin. Then using the medium nested Mitten die, I cut two from felt. I re-purposed a hair clip that I found in the bathroom – I don’t know what the "real" name is, but it is metal and is similar to a clothespin in that when you press on both sides of the end, on the other end it opens like a mouth. I cut a small slit at the top of my felt and inserted the hair clip between my two pieces of felt so that in the end I would have paper, clip, felt, felt, clip, paper – the clip is sandwiched between the paper and felt. I kept my card very simple as it’s intended to hold the clip when giving as a gift. 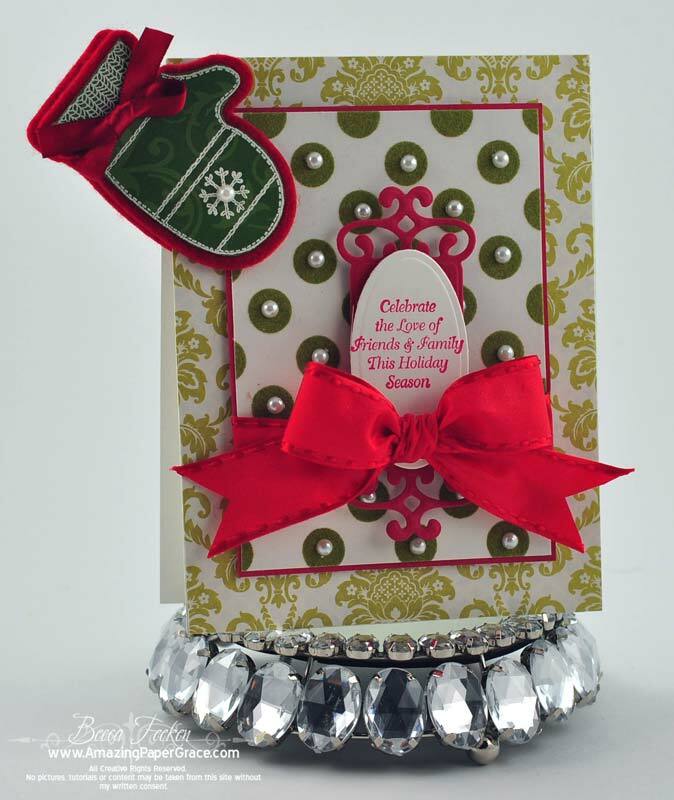 I centered a sentiment using Spellbinders Petite Ovals Small and Fancy Tags then tied a bow. The Mitten Clip simply clips on the side of the card. Please visit these designers’ blogs to see what fabulous JustRite Christmas inspiration they have for you on the hop today! Thanks to all for your well wishes, each one brings a breath of hope. I’m at a loss for words over my hubby’s health it’s nothing less than a roller coaster. Knowing we have our faith, friends and the love of family helps us put one foot down in front of the other and keep going. Please continue your prayers if you can, both John and I appreciate it. Becca, you have done it again. What a great idea. That clip looks wonderful. So does your card. I love it….and yet another way to use the Fancy Tags. I had to have them after looking at how you’ve used them on so many cards. I’m in the middle of making a card for a co-worker using them at this time…they are so versatile! Wow, I absolutely LOVE this! Gorgeous card and the clip is adorable! I log in every day to seek news about how you and your dh are faring. I log in every day to catch news of how you and your dh are faring. So clever, Becca! I love that mitten clip idea. Waanzinnig mooi, ik ben je fan hoor. Cute card. My Mom used to make those mittens and stick them all over the house. You and John are always in my prayers. I am glad that you have found the time to loose yourself in such an adorable and fun project. It is just the cutiest. Such a clever woman you are. Hugs. Great idea Becca – I didn’t think I needed this die set!!!! but you have changed that – (again). I love the clip idea mmmmmmmmm! Your *Amazing* creations always astound me … and your latest project is no exception! How you keep on keeping-on producing such inspirational projects, I will never know. 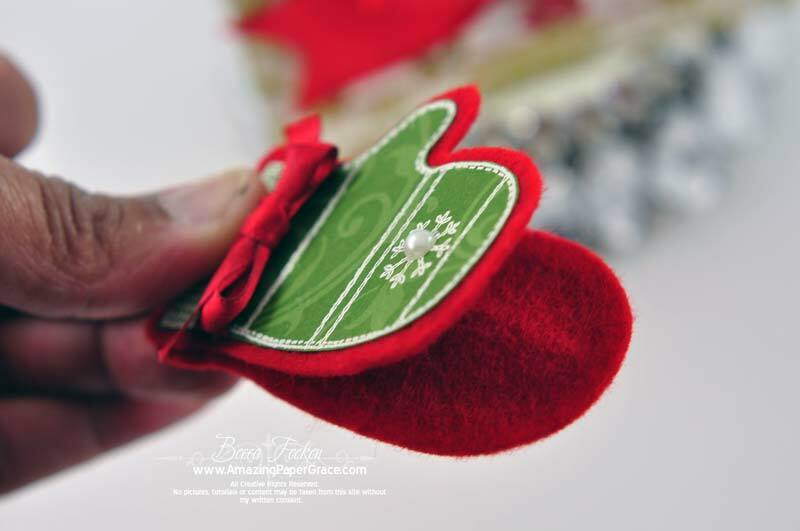 Your latest card is beautiful, and the mitten clip is such a fabulous idea! That you are able to continue your wonderful work, and that you still take the time to share it with us all at such a terribly stressful time is pretty incredible. You are truly gifted, and a very special lady. What a fabulous clip, Becca! So clever and just darling! Not to worry, Continue We Will. Checking in again to send more good wishes across the pond to you and John. Prayers are winging their way too. oh my goodness is that ever a cute and clever idea for the clip, cute card! Becca – I apologise for the e-mail I sent you recently – I am so glad that the content of that mail was totally wrong…I read your blog wrongly….I am so embarrassed about that. Two of my favorite verses that I want to pass on to you! You are such an encourager of others, I pray these will encourage you!!! Just stopping by to send the very best of wishes and to let you know that you and John are in my thoughts and prayers. Praying that all is well with you and John during these trying times. I truly miss your daily blog updates, but know that you are where you need to be right now. Wish that I could help in some way. Keep the strength. Even though I don’t know you personally, I do feel like I know you somewhat. 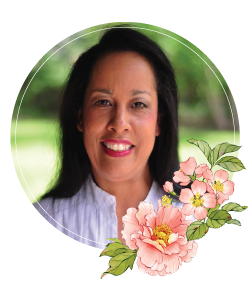 You have given that of yourself to all of us who faithfully follow your blog and there is deep concern for you, John and your family. We have been lifting you up in prayer and know that God is providing the strength you need to get you through this trial. I know you are busy with your husband and my prayers go out for both of you each day. I have just had you on my heart today hoping everything is going okay or getting better. Miss hearing from you.